One of the most requested IVR applications we are regularly asked when working with the ShoreTel product line is can we create a “customer survey” or automated voice “order entry” solution. In this application the caller is answered and greeted by an automated attendant. The callers is then asked a number of questions. All the individual answers are collected as a single voice file and sent to a predetermined voice mail box for later bulk processing. This application is actually simple to create and because it uses actual voice recordings rather than touch tone, there is no data processing requirement to review the results. The solution makes use of features available in the basic ShoreTel iPBX and as many “survey applications” are part of a Call Center, like the ShoreTel ECC, this application does not require any special equipment or additional servers. In addition to to asking customized, recorded questions that support the survey or order entry application, an automated attendant like menu can be attached to the voice questioner that offer additional options to the caller when the questioner is complete. The caller can start-over, transfer to the Operator, transfer to another application or append to the existing question stream. For example, the caller might want to place an order for additional products or services. The application also captures the normal accounting information to support the recording including date, time and callerID. As the answers are assembled as a single voice message, they can be emailed when the caller hangs up and a message waiting light or other notification alert set! The Applications enables XML tags that define actions, for example: Play a file; Record, GoTo and Menu. These simple actions can be organized to enable robust applications. 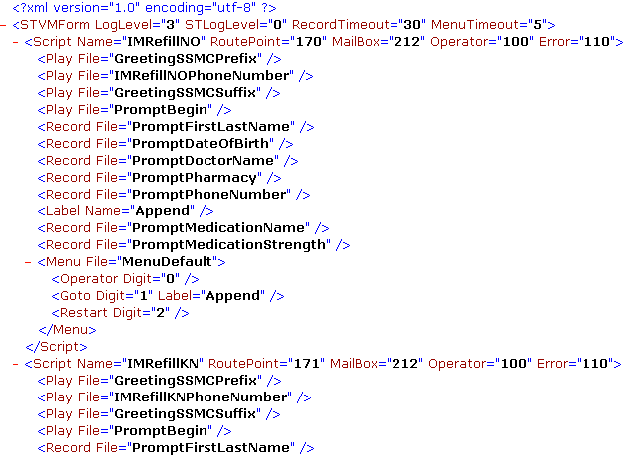 The Menu file can be used to send the caller to yet another script or forward to an operator. We created a live demo, if you would like to give it a try give us a call and we will transfer you to the demo!! This does NOT require ECC and can be done on the basic ShoreTel Server.